The new grab and go package is available for shipment July 1. NEW MILFORD, Conn., April 27, 2017 – Torie & Howard is introducing a grab-and-go stick pack of its USDA Organic Chewie Fruities fruit chews. The ship date for the 2.1-ounce stick packs is July 1. The stick packs contain 10 individually wrapped pieces of candy and are available in three sophisticated flavor duos, which include Italian Tarocco Blood Orange and Wildflower Honey, California Pomegranate and Sweet Freestone Nectarine, and Meyer Lemon and Raspberry, said Torie Burke, company co-founder. The candy is made in the United States and one serving provides the daily requirement of Vitamin C. The stick packs have a suggested retail price of $1.99 and have 18 to a display case and 12 cases in a master case, Burke said. “The early success of the 1.27-ounce trial size Chewie Fruities that we introduced last year showed us clearly that consumers like having a choice of grab and go options that are easy to throw in the car or stash in a pocket or backpack,” she said. “It also shows that even for indulgences, consumers want better-for-you options with cleaner ingredients.” All Torie & Howard candy is USDA Organic, kosher certified, contains no artificial dyes, flavors, preservatives or genetically engineered ingredients, and is free from major allergens, including soy, wheat, gluten, nuts and dairy. Chewie Fruities candy also is available in gusseted 4-ounce peg packs with a suggested retail price of $3.99 and ships six to a case and 48 to a master case. 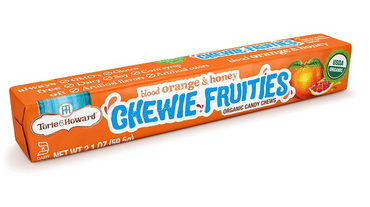 The 1.27-ounce trial size of the fruit chews has a suggested retail price of $1.69. It is available in bulk for foodservice at 150 bags per case. The 2-ounce pocket tins of Torie & Howard organic hard candy have a suggested retail price of $3.99 to $4.99 and are available eight per case with 12 cases to a master case. Also available are a Halloween hard candy assortment packaged in 10-ounce lie-flat bags and a 6-ounce handbag gift package, both with SRPs of $6.99 to $7.99. More information may be found online at www.TorieAndHoward.com or by calling 1-888-826-9554. Torie & Howard is a producer of all-natural, organic candy designed to satisfy consumers with discriminating palates who crave healthy, yet indulgent, snacks. The candy is USDA Organic and kosher certified and contains no genetically modified organisms. The company was launched by color consultant Torie Burke and interior designer Howard Slatkin in early 2012 with headquarters in New Milford, Conn., with a pledge to produce snacks in ways that are as health-friendly, eco-friendly and socially conscious as possible. The candy is available nationally through foodservice and 26,000 retailers, including Whole Foods, The Fresh Market, H-E-B, Kings, Balducci’s, Dean & Deluca, Earth Fare, Central Market, select CVS stores, and online at www.TorieAndHoward.com. More information is available by connecting via https://www.Facebook.com/TorieandHoward, https://Twitter.com/TorieandHoward, and https://www.Pinterest.com/TorieandHoward/ or calling 1-888-826-9554.